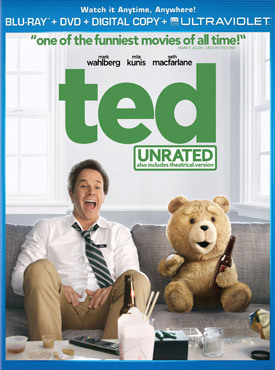 Seth MacFarlane’s Ted Announced and Detailed on Blu-ray and DVD. Universal Studios Home Entertainment has announced and detailed the Blu-ray and DVD release of the adult comedy Ted, starring Mark Wahlberg and Mila Kunis with Seth MacFarlane as the voice of the title character. See the disc special features and movie trailer Ted below. The movie tells the story of, John Bennett (Wahlberg), a grown man who must deal with the cherished teddy bear who came to life as the result of a childhood wish…and has refused to leave his side ever since.